Officers at the UW-Madison Police Department use a variety of equipment to keep our campus community safe. This ranges from first aid equipment and AEDs, radios, pepper spray, K9s and horses, stop strips (used to stop vehicles in a pursuit), and even books and other comfort items to help calm our youngest community members in an emergency or crisis situation. On a typical work day, our officers drive a Ford Interceptor SUV. UWPD also owns several Dodge Caravans and two Chevy Suburbans, used primarily for special events and assignments. All officers are issued a rifle and have access to a less-lethal shotgun (bean bags rounds). On their duty belt, they carry a Glock firearm, pepper spray, a Taser, radio, surgical gloves, a baton, and handcuffs. Officers who work patrol also wear a body camera, which is activated and turned on when they respond to a call. UWPD has not sought or received any equipment from the federal government. However, in the interest of transparency, UWPD is sharing with our community the equipment that we own that is included in “prohibited” and “controlled” equipment lists, created by Executive Order 13688. Prohibited Equipment List – the Prohibited Equipment List identifies categories of equipment that LEAs will not be able to acquire via transfer from the military/federal agencies or purchase using federally‐provided funds. Controlled Equipment List – the Controlled Equipment List identifies categories of equipment that LEAs may acquire from the military/federal agencies if they provide additional information, certifications, and assurances. While inclusion on these lists would not preclude a LEA from using other funds for such acquisitions, the Working Group’s report urges LEAs to give careful consideration to the appropriateness of acquiring such equipment for their communities. Below are the complete prohibited and controlled equipment lists that the interagency Law Enforcement Equipment Working Group created; following each item is a notation, identifying if UWPD owns or has access to that equipment. 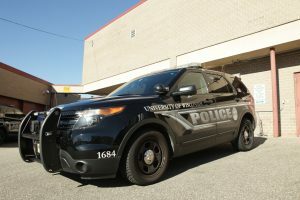 If UWPD determines that it needs to own equipment on the prohibited and/or controlled lists (in addition to what is already owned), the department will seek input from the campus community. Tracked armored vehicles: vehicles that provide ballistic protection to their occupants and utilize a tracked system instead of wheels for forward motion. Weaponized aircraft, vessels, and vehicles of any kind: These items will be prohibited from purchase or transfer with weapons installed. Grenade launchers: firearm or firearm accessory designed to launch small explosive projectiles. None. However, UWPD does own “launchers” specifically for dispersing crowd control chemical dispersants and less lethal rounds. The launchers could be capable of launching military explosive grenades. However, we do not possess those types of munitions and have no plans to in the future. Bayonets: large knives designed to be attached to the muzzle of a rifle/shotgun/long gun for the purposes of hand‐to‐hand combat. Camouflage uniforms: does not include woodland or desert patterns or solid color uniforms. Manned aircraft, fixed wing: powered aircraft with a crew aboard, such as airplanes, that use a fixed wing for lift. Manned aircraft, rotary wing: powered aircraft with a crew aboard, such as helicopters, that use a rotary wing for lift. Unmanned aerial vehicles: a remotely piloted, powered aircraft without a crew aboard. Armored vehicles, wheeled: any wheeled vehicle either purpose‐built or modified to provide ballistic protection to its occupants, such as a Mine‐Resistant Ambush Protected (MRAP) vehicle or an Armored Personnel Carrier. These vehicles are sometimes used by law enforcement personnel involved in dangerous operating conditions, including active shooter or similar high‐threat situations. These vehicles often have weapon‐firing ports. None. However, in the effort of full disclosure, nearby law enforcement agencies own armored vehicles, and by request, could bring those vehicles to UWPD’s jurisdiction to protect officers and civilians during rescue operations during an emergency response to an incident. Tactical vehicles, wheeled: A vehicle purpose‐built to operate on‐ and off‐road in support of military operations,such as a HMMWV (“Humvee”), 2.5‐ton truck, 5‐ton truck, or a vehicle with a breaching or entry apparatus attached. These vehicles are sometimes used by law enforcement in rough terrain or inclement weather for search and rescue operations, as well as other law enforcement functions. Command and control vehicles: any wheeled vehicle either purpose‐built or modified to facilitate the operational control and direction of public safety units responding to an incident. Command and Control vehicles provide a variety of capabilities to the incident Commander, including, but not limited to, the provision for enhanced communications and other situational awareness capabilities. None. However, in the effort of full disclosure, nearby law enforcement agencies own command and control vehicles, and by request, could bring those vehicles to UWPD’s jurisdiction for use. These vehicles serve as a “hub” for a command post. Specialized firearms and ammunition under .50‐caliber (excludes firearms and ammunition for service‐issued weapons): weapons and corresponding ammunition for specialized operations or assignment. This excludes service‐issued handguns, rifles, or shotguns that are issued or approved by the agency to be used during the course of regularly assigned duties. Explosives and pyrotechnics: includes “flash bangs” as well as explosive breaching tools often used by special operations units. Breaching apparatus (e.g. battering ram or similar entry device): tools designed to provide law enforcement rapid entry into a building or through a secured doorway. These tools may be mechanical in nature (a battering ram), ballistic (slugs), or explosive. Riot batons (excluding service‐issued telescopic or fixed‐length straight batons): non‐expandable baton of greater length (generally in excess of 24 inches) than service‐issued types and are intended to protect its wielder during melees by providing distance from assailants. Yes, UWPD owns riot batons. Riot helmets: helmets designed to protect the wearer’s face and head from injury during melees from projectiles including rocks, bricks, liquids, etc. Riot helmets include a visor which protects the face. Yes, UWPD owns riot helmets. protection as well. Riot shields may also be used as an offensive weapon to push opponents. Yes, UWPD owns riot shields.